Credit cards emerged as the first viable option for funding online gambling accounts, but players were soon using eWallets in the shape of NETELLER, Skrill, and PayPal. That moment came in the early-2000s, with e-Vouchers then appearing as a more niche option for punters to consider. The name eVoucher is simply intended to convey the concept of an electronic voucher that can be redeemed online with eCommerce vendors. Today, those vendors now include sports books, poker sites, and online casinos, with many of them accepting a minimum of one eVoucher, in many cases. Essentially, eVouchers operate as prepaid vouchers that are acquired in advance. For punters without a credit or debit card, they can visit their local eVoucher seller and then purchase one that can redeemed with their preferred online gambling operator. eVouchers can also be purchased from a security perspective, with players able to withhold their credit card details. Ultimately, if they end up earning winnings, then they can request a direct bank transfer or a cheque at a later date – all while keeping their financial details entirely private. • PayPoint: visit the PayPoint website and you search through thousands of options to find a local vendor based in the UK, Ireland, or farther afield. The voucher can then be claimed online with a gambling site that is partnered with PayPoint. • paysafecard: this is far and away the most widely accepted eVoucher by gambling sites. Ukash used to be a viable competitor, but was eventually acquired by Paysafe Group in July 2015. Trying to pick an online casino to play at? Be sure to visit our Gambipedia.com’s Casino Bonuses page. Depositing with an eVoucher requires more effort than making an online transfer, but it’s a process that is straight-forward and easy to understand once you have made adequate preparations. • Find a participating site: let’s say that there are a few gambling sites you are considering to sign up with. First of all, you will need to look through each of the sites to view the accepted deposit methods. • Check the deposit methods: next, you should look through the payment partners listed at the base of the gambling operator’s homepage. Pay close attention for the likes of ecoPayz, PayPoint, or paysafecard. There is no sense in paying for an eVoucher until you know if you can use it or not. • Visit the eVoucher provider: paysafecard is usually the most commonly accepted, so let’s say that you settle on that method. Now, you can visit the paysafecard to perform a search for the nearest vendor. • Get the eVoucher: now that you know where the vendor is situated, you can visit them in person and acquire the eVoucher using either cash or a credit/debit card. • Redeem the eVoucher: after creating your new online gambling account, you should take the opportunity to access the cashier/banking function. In this section, select the deposit option and select the eVoucher of your using. At this point, you will be asked to submit the code listed on the eVoucher to process your deposit. Read more about other types of depositing methods. Be sure to check our Depositing method: pay by phone bill page. Each payment methods comes with an array of strengths and weaknesses that can impact their appeal among punters. • Be willing to shop around: paysafecard is usually a safe option, but you might have to use ecoPayz or PayPoint if you wish to try out other gambling sites. • Plan a withdrawal method in advance: it is overwhelmingly the case that gambling sites don’t have the capacity to generate eVoucher codes for handing out winnings. Using a credit/debit card defeats the purpose of using an eVoucher, which means you should try using an eWallet or requesting a cheque for claiming funds. • Get ready for identity checks: credit and debit cards are often used for confirming people’s identities and ages. By using an eVoucher, you are likely to be asked to submit scanned identity documents for verification before withdrawing. • Never share credit card details: by choosing en eVoucher, you should never provide your credit card number, as this entirely defeats the purpose of using it. 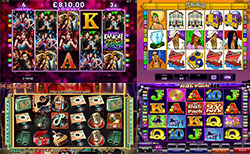 Simply walk away from the casino if they won’t accept the deposit with only the eVoucher code. An eVoucher lets you hold back your private financial details and still enjoy the services of participating gambling sites.